If you are self-employed, then filing your taxes is a huge item on your to-do list this time of year. Not only is it essential that you pay your self-employment taxes on time each year, but you also need to do quite a bit of legwork to ensure that you are paying the correct amount of taxes, paying at the correct time, and claiming the appropriate deductions so you don't overpay. If you are considering becoming self-employed, you need to be aware of your tax obligations before you take the step. Pay your self-employment taxes by following these easy steps. Are you a sole proprietor? An S-corporation? A C-corporation? Or an LLC? 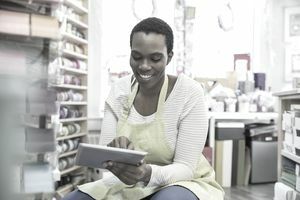 Before paying your self-employment taxes, you need to firmly establish which class your business falls under, as the tax rules vary by classification. In general, you need to file self-employment taxes if your business made a net profit of $400 or more. First, you need to determine how much you need to pay. You can do this by talking to a tax accountant. The accountant can help you determine how much you will owe based on your past earnings or projected profits. The self-employment tax rate is 15.3% and is made up of two parts: 12.4% for Social Security and 2.9% for Medicare. Self-employed people are also required to pay income taxes. You may also have to pay taxes quarterly if you are self-employed. If you have been in business for a year or longer, you can determine estimated quarterly payments based on last year's income. Simply divide what you paid last year by four and pay that much each quarter. Your tax accountant can help you determine if you need to raise or lower this based on your current business projections. As a self-employed person, it's wise to set aside money each month for taxes so you aren't hit with a huge tax bill (and no money set aside to pay it) come tax time. A good rule of thumb is to set aside 30% of your income for your taxes for the year. If you have state taxes, you may need to adjust the amount you save to include your state taxes. The IRS allows you to make payments online through the IRS website. You need to register for a PIN and that can take a few weeks to process, so you should register well before the payment due date in order to make the payment on time. You may also mail payments via standard mail. Taking the steps necessary to pay your tax bill on time is of utmost importance. If you make a late payment, you will have to pay a late fee of 5% of unpaid taxes for each month that your bill is late. This starts the day after the tax filing due date and can't exceed 25% of your unpaid taxes. Use a reputable CPA and follow his or her advice. While it's never a bad idea to do research and be well-informed on your own—especially as a self-employed person—your accountant can help you save money by knowing certain deductions and rules that you may not be aware of yourself. For example, you may be able to deduct your retirement contributions, your health costs and many of your business expenses. This is an important part of making the most of your money. Many people do not remember to pay their quarterly taxes for their state. Your accountant will help you determine the amount you need to pay since the state income tax rate varies from state to state. Generally, the payments for state income taxes are due at the same time as the federal payments, which can help streamline the process. Be sure to see if you owe city taxes, as well. If you are a college student or recent grad, you may be eligible for higher benefits. If you do need an accountant, you should look for an accountant that you can trust, and who will work with you. You can ask family and friends for recommendations. Be sure to deduct any eligible business expenses when doing your taxes, which can save you money.